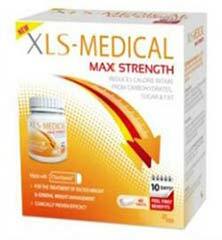 XLS Medical Max Strength is a dietary supplement designed to provide a combination of fat blocking and carb blocking benefits. In a way, “blocker” type supplements are similar to appetite suppressants because they restrict the amount of calories that enter the body. However, the calorie reduction is achieved in a different manner. Appetite suppressants reduce hunger urges and make it easier to eat less food. Blocker type supplements reduce the amount of calories the body is able to obtain from the food that has already been eaten. Each gram of fat that enters the body would normally deliver nine calories and each gram of carbohydrate would deliver four calories. By preventing these two important nutrients from releasing their full load of calories, a product like XLS Medical Max Strength should have a lot to offer as weight loss aid, but quality counts when it comes to products like this, so let’s take a closer look at XLS Medical Max Strength and see if it is likely to be a dietary aid you can count on or just another diet pill that has more to offer in the way of hype than it does in the way of power. XLS Medical Max Strength is designed to disrupt the actions of the digestive enzymes that are necessary for breaking down fat, carbohydrates and sugar. This causes the aforementioned nutrients to be too large (on a molecular level) to be absorbed through the walls of the intestines. If they are not absorbed they cannot deliver any calories. It’s as simple as that—in theory. But let’s take a look at how well this product is likely to work in the real world. The only active ingredient in XLS Medical Max Strength is a proprietary blend called Clavitanol. It’s the brainchild of the InQpharm pharmaceutical company and they are so enthusiastic about Clavitanol’s abilities they have created a website designed to convince people how good it is. The site lacks a lot of important information though, such as what the Clavitanol blend actually contains. It merely states it’s a “plant-based polyphenol”. That could be just about anything, so we are not impressed. There is also a shadow of doubt about the study referenced in the XLS Medical Max Strength marketing material. The data appears to suggest Clavitanol is a powerful product, but the author of the study states there is no conflict of interests. This is not true. InQpharm sponsored the study. This could mean it was biased in their favour. There were also errors in the reported hip measurements, and the article had to be corrected. Two tablets are required 30 minutes before the two the main meals of the day. It is important to take the tablets with water and not to exceed the recommended dose of four capsules per day. Good results will require a supplementation period of at least four weeks and diet and exercise will be needed. The XLS Medical website provides a free diet plan and exercise sheet to help give dieters a push in the right direction. The marketing material states the tablets are tolerated well by most users but may cause a minority of users to experience flatulence. This apparently passes after a few days. However, we have concerns about this product because the contents of the Clavitanol proprietary blend are unknown. With this in mind we suggest all potential users check with their GP prior to using XLS Medical Max Strength to try and lose weight more easily. The XLS Medical brand has been around for a while and has gained quite a lot of respect for its blocker-type supplements. The company’s flagship product was a fat blocker, and they also market a carb blocking product, but they state XLS Medical Max Strength is superior to their previous products and up to 33% more effective than their original fat blocker. That’s a big claim to make because, in 2014, the market research company TNS conducted a survey and slimming products and XLS Medical Fat Binder was voted slimming product of the year. 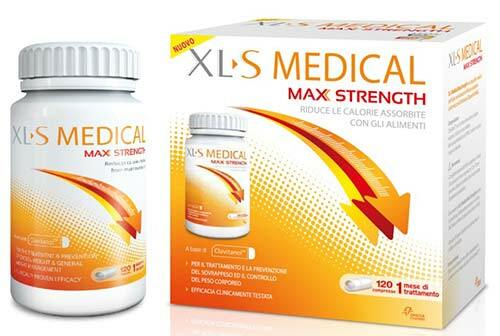 XLS Medical Max Strength is available from most pharmacies, including Boots and Lloyds. You can also buy it at Tesco, Superdrug, and many high street stores. Prices can vary, but expect to pay around £25 per 20 capsules and around £10 more for the 40-capsule option. The fact that XLS Medical Max Strength is being retailed by respected companies, like Boots, enhances manufacturer credibility and there is no denying the value of blocker-type supplements, but the lack of information about the key ingredient provides cause for concern. Dieters should not be expected to consume products when they do not know all the components they contain. The conflicting nature of customer reviews is also not a point in this product’s favour because the formulation appears to work better for some people than it does for others and there is no money back guarantee. Most of today’s leading diet pills have better customer reviews, are cheaper to use, and come with a money back guarantee. XLS Medical Max Strength certainly has potential, but there are other options available that can offer better value for money.